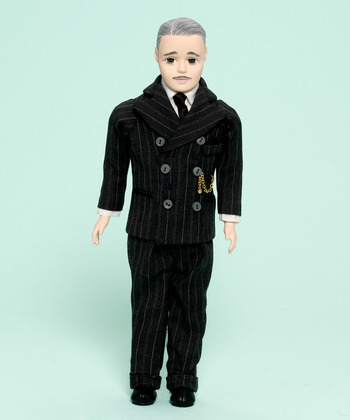 Gomez from The Addams Family Musical features the first ever 10-inch male figures created by Madame Alexander. He sports a sleek, painted-on hairstyle, expressive eyebrows and the very finest of moustaches. His grey pinstriped suit pairs a double-breasted, un-vented, jacket with matching, high-waisted, pleated pants. Beneath the jacket he wears a sleeveless white shell, a black satin tie attached to his white collar and white cuffs stitched to the interior of the jacket sleeves. The jacket is embellished on the front by grey buttons with hidden snaps for closures, black cotton soutache applique used to create faux pockets, a silver watch chain stitched into the watch ‘pocket’ and a stitched in black satin pocket square. A white broadcloth, step-in undergarment, black socks and black ankle boots completes his dark look and has him ready to dance the Tango. Suitable for ages 14 and up.